This week I wrote blog posts that highlighted both BU and BC’s recruiting classes for the upcoming 2017 season. In looking beyond 2017 at future commits a few big time prospects from Massachusetts are in the pipeline for both schools that we will be talking a lot about in the years to come. I will profile these guys in the next few blogs, let’s start with Jake Wise who is BU commit for 2018-19…. 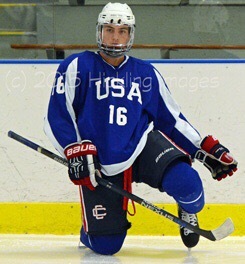 Jake Wise (5’10 185 lbs) – Wise is a North Andover, MA native who committed to play at BU at the age of 14. He burst onto the national radar in 2012-13 at the Quebec International Pee Wee tournament where he won tournament MVP by posting 11 goals in 6 games and leading his Minuteman Flames team to victory. From there he moved on to play the 2013-14 season with the Middlesex Islanders Bantoms putting up a ridiculous 118 points in 48 games (56g/62a). Wise spent his Freshman and Sophmore years of high school playing at Central Catholic under Kim Brandvold, the Associate Head Coach at Central who also worked with Wise as a skills coach from a young age as well as coaching him in his season with the Islanders. He was selected this season to play for USA Hockey’s national team U17 squad where he posted 28 points (9g/19a) in 58 games. With his tremendous skill set, Wise is considered one of the top prospects for the 2018 draft even drawing comparisons to Jack Eichel another Massachusetts native who followed a similar path through the USNTDP and then to BU for a year before being selected #2 overall in the 2015 draft. In terms of adversity, another thing to note is USA hockey announced it’s roster this week for the IIHF Under-18 Men’s World Championship from April 13-23, in Poprad and Spišská Nová Ves, Slovakia. That roster is comprised of mostly 1999 birth years but two 2000 birth years that played with Wise on the U17 squad were selected – Oliver Wahlstrom and Joel Farabee. A little adversity can be good for any hockey player and with everything I read about this kids work ethic and commitment I expect Wise to have a big year in 2017-18 and be a star for BU come 2018-19. Definitely an exciting prospect to watch and we will track his progress here throughout next season and beyond.